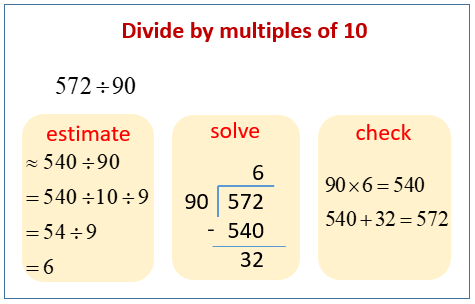 Examples, solutions, and videos to help Grade 5 students learn how to divide two- and three-digit dividends by multiples of 10 with single-digit quotients and make connections to a written method. The following example shows how to divide a three-digit dividend by a multiple of 10. Scroll down the page for more examples and solutions. At the Highland Falls pumpkin growing contest, the prize winning pumpkin contains 360 seeds. The proud farmer plans to sell his seeds in packs of 12. How many packs can he make using all the seeds? Note: Although the students have not yet done three-digit totals divided by a two-digit divisor, this problem has the basic fact 12 × 3 = 36 embedded in it, and it’s similar to problems encountered in G5–M2–Lesson 18’s Concept Development. 3. A number divided by 80 has a quotient of 7 with 4 as the remainder. Find the number. This video shows how to divide a two or three digit number by a multiple of 10. Divide, then check using multiplication. This video demonstrates how to divide three digit numbers by multiples of 10 divisors. 1. Divide, then check using multiplication. The first one is done for you. 2. A number divided by 40 has a quotient of 6 with a remainder of 16. Find the number. 3. A shipment of 288 textbooks has been delivered. Each of the 30 classrooms will receive an equal share of the books, with any extra books being stored in the bookroom. After the texts have been distributed to the classrooms, how many will be stored in the bookroom?